First things first: I am COMPLETELY biased when it comes to the city where I was born and raised, Birmingham. 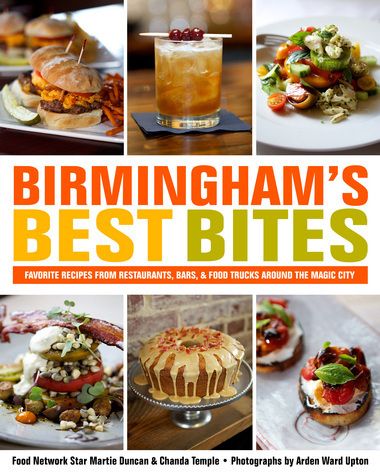 When I first caught wind of the release of Birmingham’s Best Bites: Favorite Recipes From Restaurants, Bars, & Food Trucks Around The Magic City, I could not wait to add this gem to my “foodie arsenal”. After a successful Restaurant Week event in the city, I find it only fitting to discuss a few of my favorite dishes and recipes featured in this cookbook. Broken down into several sections and filled with awesome photography (by Arden Ward Upton), this cookbook truly captures some of Birmingham’s best restaurants, past and present. Although I’ve found it very difficult to break down my top favorite recipes, here are a few of my favorites. You will have to purchase the cookbook yourself to see the rest! Bellini’s is one of my favorite restaurants in Birmingham. Earlier in the year I had the pleasure of attending #EatDrinkBham, where I sampled this dish and it was nothing short of AMAZING. This dish is prepared with a potatoes, a corn mixture, drizzled with a balsamic glaze. I’ve never had this particular flavor, but Dream Cakes Bakery never disappoints! I’d love to attempt to bake this one day. These are only a few of my favorite dishes shared throughout this cookbook. I can’t wait to try some of the other dishes and share my thoughts on the blog. Stay tuned to the blog for future foodie reviews! Have you purchased or read this cookbook yet? Let me know some of your favorites in the comments section! Previous Post When Bad is Really, REALLY Good!